Leah Williams Veazey explores the intersections of migration, motherhood, and digital cultures in contemporary Australia. Migration and motherhood are both significant life changes. They disrupt social infrastructures, requiring the rapid acquisition of new knowledge and new networks, and the renegotiation of identity. In this age of the “connected migrant” and “digital motherhood”, migrant mothers in Australia are turning to social media to help them manage life as a mother away from ‘home’. A Facebook search in 2015-2016 found over 80 groups specifically for migrant mothers living in Sydney, and around 60 for migrant mothers in Melbourne. Some groups have only a handful of members, others have thousands. The Indian Mums Connect (Sydney) group currently has over 19,000 members. Mothers and babies at a ‘Back to St Monan’s Day’ afternoon, 1959 (Mosman Library). Image via Flickr. These migrant maternal Facebook groups are part of an established landscape of mothers’ groups in Australia. 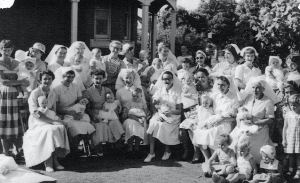 Nurse-run groups and baby clinics were established in Australia in the early twentieth century to educate new mothers and reduce infant mortality rates. The 1970s saw a change to a more socially-oriented service, providing information and social interaction to support mothers in their new role. Despite an official shift in 1997 to the gender-neutral term “parents’ groups,” these groups are still commonly referred to as “mothers’ groups”. (The 2017 ABC comedy series The Letdown centred on one such parents’ group, including a token stay-at-home dad among the collection of new mothers.) Almost all research focuses on mothers’ experiences of these groups. I interviewed 41 women who had created or joined a Facebook group for migrant mothers in Australia. Some were recent migrants or new mothers; others had migrated years earlier or were mothers to teenagers. The women came from Brazil, Colombia, Germany, India, Iran, Ireland, Malaysia, Singapore, Sweden, and the United Kingdom. The Way You Mother, Thomas Hawk. Image via Flickr. As well as these knowledge-based settlement activities, mothers also use the groups to re-build their social infrastructure. They arrange meet-ups in parks and cafes, set up playgroups, arrange cinema outings. Women engage in these ‘relational settlement’ activities to make a place for their family in their new local community. Importantly, though, women also emphasised the importance of the groups for seeking friendship and support for themselves. Many of the migrant mothers reflected on their difficulties forming friendships after migration. Those who had migrated with young children had often left behind employment, as well as family and friends. Those who became mothers after migrating realised the inadequacy of their workplace-centred social networks to support them in their new maternal life. Siobhan*, a 40-year-old Irish migrant and new mother, wistfully imagined the support she would have ‘back home’ where she lived close to her parents and saw her mother nearly every day. Siobhan’s mother looks after her other grandchildren until they go to school, and her mother’s house is the “meeting point” for the whole family. Living in the same town where she’d grown up, Siobhan had a large network of friends and family. Her husband’s family also lived nearby. The contrast is stark with the long days she now spends alone with her baby while her husband works long hours, six or seven days a week. She longs for someone to bring her a cup of tea or hold the baby for a moment. Even though she has never met up with anyone from the Facebook group, she finds it reassuring to know that she could. Observing online conversations in the group reassures her that she is “not the only person feeling that way,” that is, lonely and homesick. Feminist scholars of technology have argued that online community management, paid and unpaid, should be understood in relation to gendered emotional, relational, and reproductive labour (de Winter et al., 2017; Jarrett, 2016; Portwood-Stacer, 2014). My interviews with the groups’ administrators support this contention (15 of the 41 women I interviewed held an administrator role in their group). 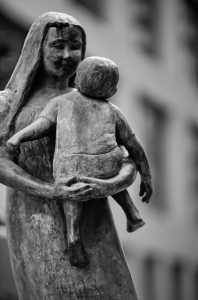 Administrators shape the migrant mothers’ groups into sites of belonging and trust, using ‘meta-maternal practices’ to establish a behavioural norm of compassion between mothers and build migrant maternal solidarities. They establish and maintain boundaries and behaviours through role-modelling, empathetic interventions and compassionate discipline, and nurture relationships between the members. Drawing on a concept from Black feminist scholars like Patricia Hill Collins and Arlene Edwards, I suggest the administrators’ practices constitute a kind of digital “community mothering”, in which a maternal ethic of care extends beyond the needs of one’s own children into maternally-based community service and community-building. While not dismissing concerns that digital technologies can be used to create “virtual ghettos” my research has found that migrant mothers use online communities to make a place for themselves and their families in their local community. * All participant names are pseudonyms. Leah Williams Veazey was recently awarded her PhD from The University of Sydney for her research on migrant mothers’ online communities. 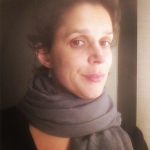 Currently working in casual academic roles at The University of Sydney, Leah is a qualitative feminist sociologist with a broad interest in the sociology of migration, gender, parenting, and the intersections of these with digital cultures. As well as her academic research, Leah draws on her professional experience in online community management and non-profit communications in women’s and health organisations. Follow Leah on Twitter @leahmouse. This entry was posted in Research blogs. Bookmark the permalink.